Australian Icons salutes 20 great Australian artists represented in the Art Gallery of New South Wales. Many of the finest works of art produced in this country are showcased with some 300 paintings, sculptures, and works on paper. The exhibition presents a panorama of Australian art from that inspiring moment of national identity achieved by the Heidelberg School, to modernism and to the present day. Selected entirely from the Gallery�s collection, this edited version of Australian art history demonstrates how the work of these artists has contributed to the definition of our cultural heritage. Australian Icons is part of the Sydney 2000 Olympic Arts Festival. ABN AMRO Rothschild has sponsored the Gallery's Australian collection research and exhibition program for over five years. This generous sponsorship has enabled the gallery to produce many exhibitions and supporting publications addressing significant artists including: William Dobell; Rosalie Gascoigne; Rayner Hoff; Robert Klippel; Jeffrey Smart; the prints, drawings and watercolours within the Australian collection and the Australian Collection Focus Series concentrating on individual works. This year ABN AMRO Rothschild�s sponsorship of the exhibition Australian Icons includes the conservation program and exhibition design together with a magnificent publication showcasing the Australian collection. This comprehensive book consists of 13 essays and 270 colour illustrations. In the words of Barry Pearce, Head Curator of Australian Art and Curator of the exhibition: �This project has given us the opportunity to polish the family silver. For the past two years the conversation department has been cleaning, restoring, refurbishing frames to make the collection look its best. Now we have the opportunity to re-acquaint, or see for the first time, many great Australian works by great Australian artists, continued Mr Pearce. The exhibition dominates the entrance level of the gallery with each artist represented in space designed to reflect the ambience of their vision and story. Visitors move through the exhibition beginning with Tom Roberts and Arthur Streeton - the golden age of Australian painting - when a glorious group of works was purchased to give the Gallery�s Australian collection its foundation. From Roberts and Streeton they enter the world of George Lambert, one of the most represented painters in the Gallery. 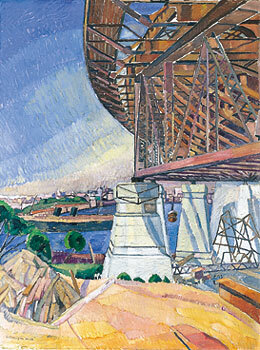 Then the modern era unfolds, as the works of Grace Cossington Smith and Margaret Preston place us on a track towards our own time. The selection of Preston�s paintings and woodcuts in particular are seen en masse for the first time in many years. The exhibition continues, a tale of public collecting woven by the warp and weft of inspiring careers; through the paintings and paperworks of William Dobell, Russell Drysdale, Sidney Nolan, Ian Fairweather, John Passmore, Lloyd Rees, Arthur Boyd, Fred Williams, James Gleeson, John Olsen and Brett Whiteley; through the sculptures of Bertram Mackennal and Robert Klippel; and the superb bark paintings of two Aboriginal masters, Mawalan Marika and Munggurrawuy Yunupingu. This is at once a celebration of Australian art through a collection, and a story of Australian life and identity through the eyes of twenty of its ambassadors. Australian Icons is generously sponsored by ABN AMRO Rothschild.